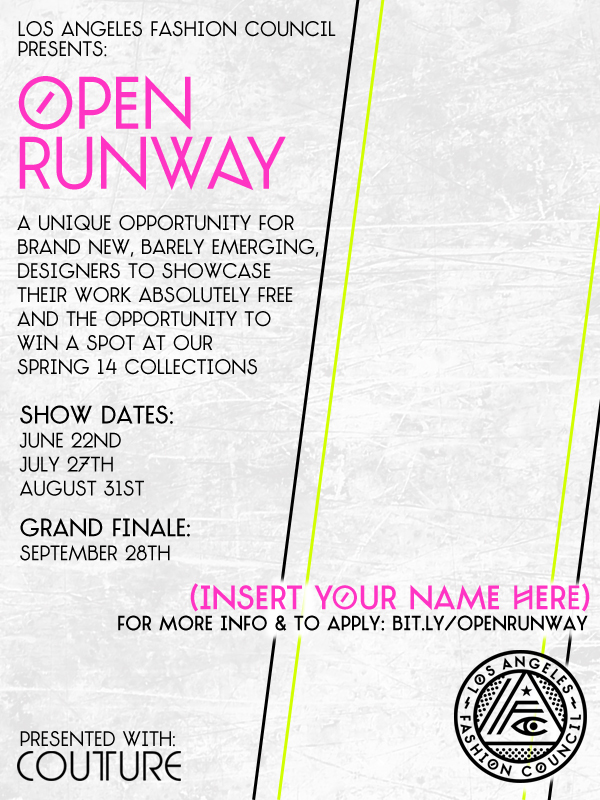 Emerging Designers – LAFC Wants You! Let’s face it, not every designer can be on Project Runway or Fashion Star (nor may they want to). If you happen to be one of the above you’ll be happy to know that, starting this June, the Los Angeles Fashion Council is launching a new “home town” series in conjunction with Couture Los Angeles geared toward discovering the next great talent in emerging designers. 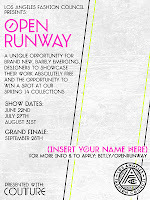 Dubbed “Open Runway,” this monthly showcase will present a unique opportunity for emerging designers to showcase their work in an Open Mic format without the need of a big budget or tons of experience. Each show will feature a handful of designers and after each presentation a look from each collection will be loaded on to Facebook to be voted on by fans. A winner from each week will continue on to the Grand Finale (taking place September 28th ) where the grand prize winner will receive a complimentary spot in the LAFC Spring 2014 Collections Showcase.